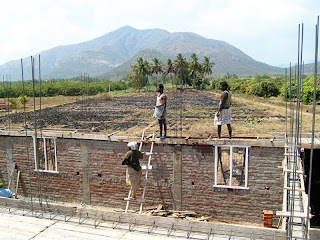 It was very exciting and a little scary when work started on the buildings. 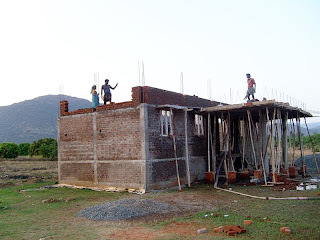 We only had a portion of what it would cost to complete stage one but we decided we’d start the work and trust God to provide what was needed. 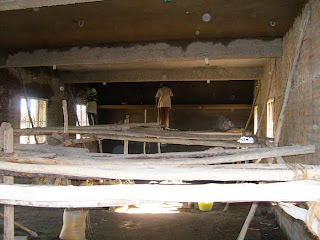 Israel sent us many photos to show us the progress of the building works. 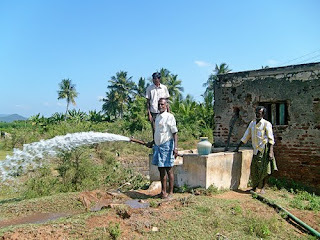 First the pump to the existing well was repaired to supply water during the construction stage. 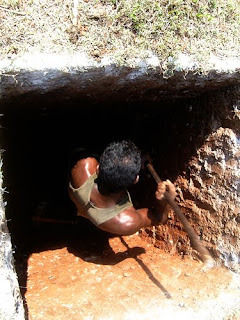 The holes for the foundations were dug by hand using labourers hired from the local village. 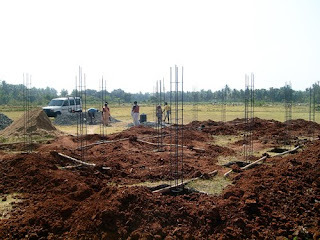 The foundations with iron rods in place, ready to start pouring the first concrete. 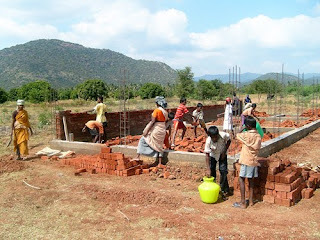 During the construction stage, the boys loved to visit the site and lend a hand. Here they are with their tools and water pots. 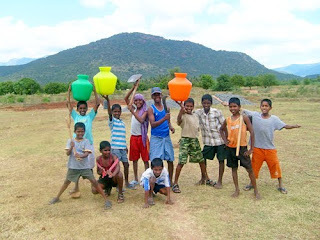 Sometimes the boys helped the village workers by carrying bricks and fetching water. The foundations finished to floor level. The walls completed to the top of window height with the window frames in place. 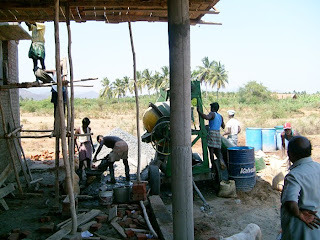 Workers mixing the concrete by hand. Brickwork continued on the walls and a roofed entry area was added to the front of the building. Bamboo scaffolding was used to support the roof during construction. Concreting the roof slab showing the form work, reinforcing rods and electrical conduit in place. 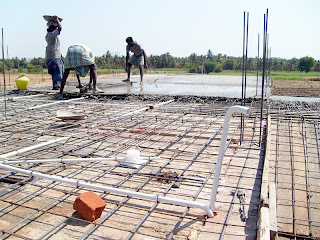 Although the construction was mainly done by hand, a concrete mixer was hired on roof slab day so the whole slab could be completed in one day. 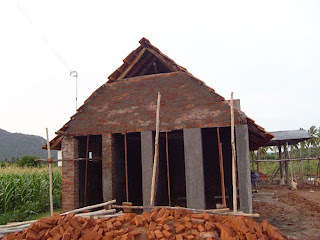 A fundraiser was held at Kenmore Baptist Church (our home church) to raise money to construct the kitchen. 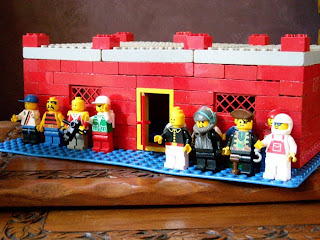 The aim was to raise funds for the kitchen by having people buy Lego bricks and build a copy of this model. This is the model that KBC built. Each different coloured brick represents a different sponsor. Everybody enjoyed adding their different bricks to the model and it gave them a great understanding of how their contribution, when combined with all the others, helped achieve something great. 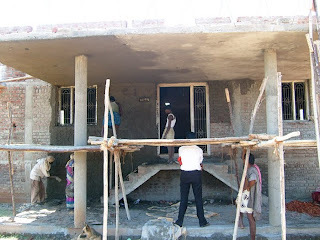 It was so well supported that enough funds were raised to build the kitchen, dining hall and toilets. 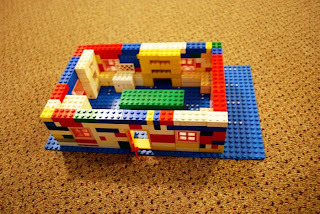 We sent some of the money from the Kitchen Lego fundraiser over the next day. 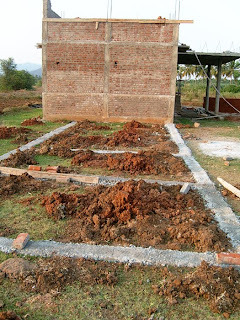 Here are the foundations already under way. The boys in front of the main building. Rendering the front of the main building. Labourers standing on bamboo scaffolding inside the building. 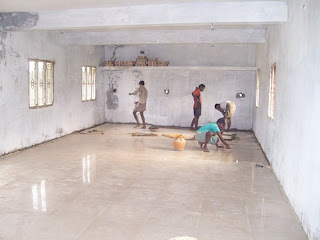 The interior with undercoat applied and the floor tiles being laid. 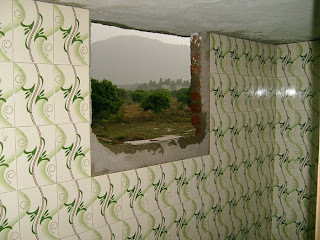 The inside bathroom where a western toilet and shower have since been installed for guests to use. 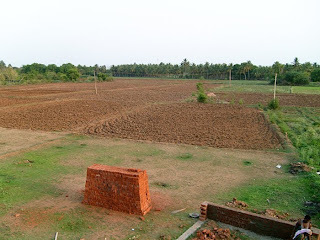 4 acres will be used for farming to support the cost of running the home and its associated activities. 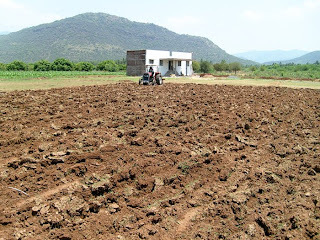 A tractor was hired to clear and plough the land. Looking from the top of the building to where the crops will be grown. 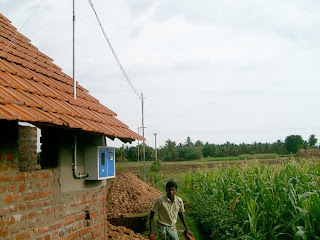 Once the monsoon rains come the rice will be planted. 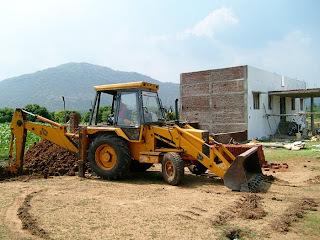 An excavator was hired to dig out the large septic tank for the boys toilets. 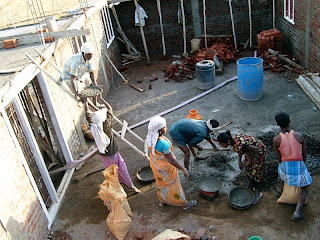 Labourers working on the kitchen, dining hall and toilets. 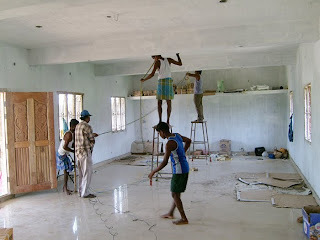 The electricians installing the electrical wiring inside the main building. 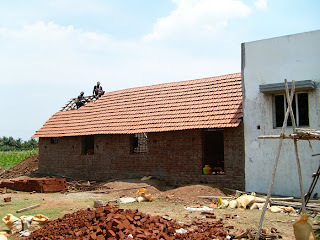 Putting tiles on the roof of the kitchen building. The electrical poles, wires and fuse box connected to the back of the building. 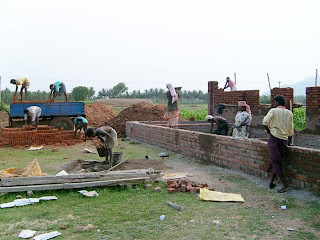 The workers doing the brickwork for the large septic tank. 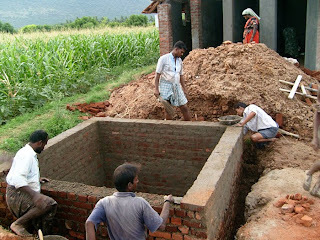 An end shot of the kitchen building showing the four squat toilets. 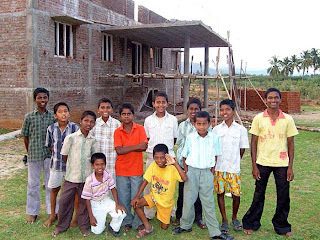 At this stage, the buildings were nearly finished and there was going to be enough room to fit in some more boys. Preference was given to boys who’d lost both parents and belonged to the lowest castes. They started arriving from their villages during the last week of May.